Transformers 2 Movie Night - A BLAST! Screening on my ticket says 9:10 PM, but the line is already long an hour before the movie started. There were rude guys trying to get into my line and I was fuming mad. This is what you get in a free seating cinema. Anyway, its been two years, and I completely forgot everything about the first movie. I got addicted to it the last time. In the course of that two years until tonight, it felt like I just got out of a drug rehab facility for Autobot addiction. I missed Optimus Prime and Bumblebee terribly. After seeing the movie, I felt like I need to do more research on the Autobots and the Decepticons - damn, there were added robots to the second movie. Visuals and sound effects were awesome, but sometimes the dialogues, especially from the speaking robots, were not that audible - maybe because of too much action or maybe the cinema sound itself. MUST WATCH IT IN IMAX SOON! It feels great to see the balance between the humans and the robots in this film. Aside from having the whole army, they've added some characters from the FBI as well. Humans and robots made an alliance to protect the earth and finish the remaining Decepticons in the planet. This may annoy you but over-all it did great on the whole action aspect of the film. 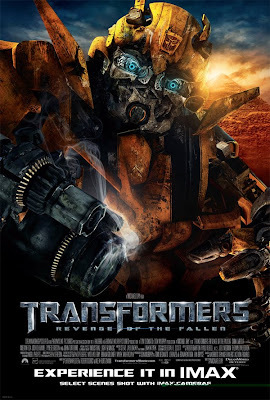 Some liked the first one better, but for me the second serving since I became a fan of Transformers when the first movie was released, is a bit better. If you’re looking to watch a movie with an outstanding story line and amazing acting - don't expect it in this movie but nonetheless, it’s the heart-pumping action that will keep you on the edge of your seat from start-to-finish. For the whole 3 hours inside the theater, I was again sitting like a geek dude. Feels great actually. Looking forward to see the 3rd movie (hopefully). When I really like a movie, I use to sit on the edge of the seat. Literally.